Over the past 13 weeks retail investors (401ks and IRA's) have pulled their money from stock market mutual funds and piled into bond funds. The following graph shows the inflow of retail (the public) money into stocks during the last two years of the greatest stock market bubble in history: 1998-2000. The right side of the graph shows the money retail investors have moved into bonds and out of stocks over the past two years. 2008-Present. 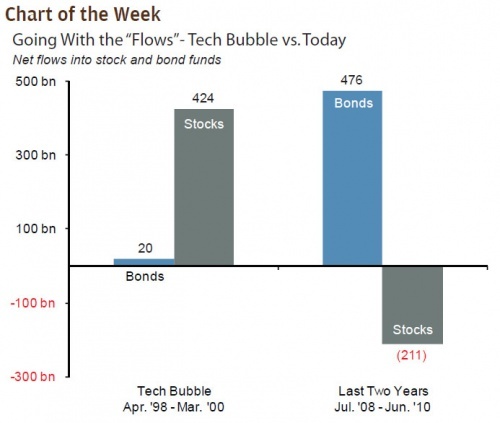 The size of the bubble has now surpassed the stock market bubble, which is staggering. While bubbles are easy to spot, it is far more difficult to know when they will pop. Many times they burst without a specific catalyst such as the stock market peak in March of 2000, or the real estate top in February of 2006.